People dream about what they want for Christmas, but for one Kona woman, her dream is coming true. “Delivering Christmas,” a 13-minute made-for-TV mini-movie starring Jessica Morris and Jason-Shane Scott, debuts tonight at 8:02 p.m. on Lifetime, Channel 448 on Spectrum cable. The short film was written by Amy Bircher, a 38-year-old married mother of two sons who works in a real estate management office. The short film features a handsome but lonely postman, Tom, who has a crush on Lauren, a single mom on his mail route who has never noticed him. 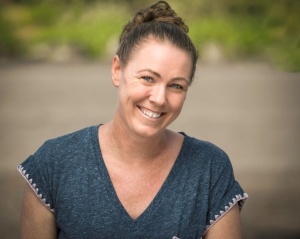 Bircher, a product of the state’s Creative Lab Hawaii 2017 Writers Immersive Program, has also optioned her “Victorian Christmas” script to a major production company. “Christmas movies are so much fun to write. There are so many aspects to Christmas. You can throw a simple story into Christmas and make a movie out of it,” Bircher told the Tribune-Herald. The “Victorian Christmas” screenplay earned Bircher her coveted fellowship in the program, which is part of the Department of Business, Economic Development and Tourism’s Creative Industries Division. The program offers writers a track to develop new content for motion pictures and television, while learning how to navigate the business. It was a mentor in the program who introduced Bircher to a producer who, after seeing a writing sample, offered her the opportunity to write “Delivering Christmas,” a work-for-hire teleplay. “It was their idea, their story, and I got to write it. It was basically a couple of paragraphs that we started with. And we did everything by email and phone,” Bircher explained. In addition to writing workshops, mentorship and help making contacts, Bircher said Creative Lab provided another tool she needed. “The very first thing they did was to provide an environment I needed to become a strong writer and a strong businessperson. I had to change my life to make room for my writing,” she said. “I’m not sure I would’ve changed what I needed to without their guidance. I might not have figured that out on my own. A Hawaii Preparatory Academy graduate and voracious reader, Bircher said the idea for “Victorian Christmas” came from an unfinished attempt to write a romance novel. Despite the title, “Victorian Christmas,” which could be produced and aired by Christmas 2018, isn’t set in Dickensian England. “With ‘Delivering Christmas’ soon to air, and three other projects already optioned from our current Writers Immersive cohort alone, we couldn’t be more proud of the quality of work that is being produced,” said Michael Palmieri, Creative Lab’s executive director and a writer-producer whose credits include the film “Six Days and Seven Nights” starring Harrison Ford and Anne Heche. Bircher also praised her fellow program participants. “My group, we’re really close,” she said. “And we’re able to give each other our scripts and give each other feedback really fast. And it’s a safe and supportive environment. And that’s something I didn’t have before. Creative Lab Hawaii offers immersive, hands-on training in broadband/new media, producing, screenwriting, interactive media, music and design/fashion. Details on the 2018 program will be announced soon at creativelab.hawaii.gov.